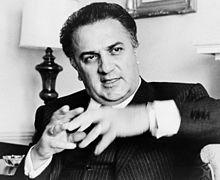 Federico Fellini (Italian: [fedeˈriːko felˈliːni]; 20 Januar 1920 – 31 October 1993) wis an Italian film director an screenwriter. Kent for his distinct style that blends fantasy an baroque images wi yirdiness, he is recognised as ane o the maist influential filmmakers o aw time. His films hae ranked, in polls such as Cahiers du cinéma an Sight & Sound, as some o the greatest films o aw time. Sight & Sound leets his 1963 film 8½ as the 10t greatest film o aw time. In a career spannin awmaist fifty years, Fellini wan the Palme d'Or for La Dolce Vita, wis nominatit for twal Academy Awairds, an directit fower motion picturs that wan Oscars in the category o Best Foreign Leid Film. In 1993, he wis awairdit an honorary Oscar for Lifetime Achievement at the 65t Annual Academy Awairds in Los Angeles. This page wis last eeditit on 24 Mairch 2017, at 21:09.